These Austrian Rumballs, or in German, "Rumkugeln" are almost mandatory for Christmas but, in our opinion, they taste awesome throughout the year. The rum balls are made after a traditional Austrian recipe from the good old times, when the emperor Franz Josef used to reign the kingdom of Germany. It is a no-bake recipe. Just stick to the given instructions and it will turn out just fine. Happy Baking! - For the dark dough mix all ingredients thoroughly. - For the light dough press the egg yolk through a sieve and mix it with the remaining ingredients; keep it cold. - Make balls out of the dark dough of walnut size; the light dough should have the size of a cherry pit (so quite small). - Place in each dark ball one light one; take the ball slightly apart and fill in the smaller one; then close it. Place them into little matching cups. 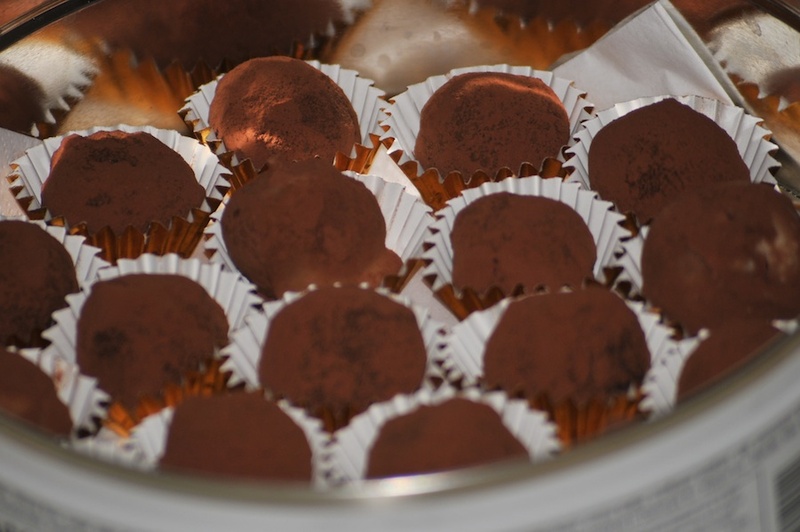 - Keep rum balls at least for 30 minutes in the fridge. - Roll the balls in the cocoa powder and place them in small paper cups. Keep the rum balls in a tin.